If you’re a baseball fan or a follower of what’s happening in the counter culture, you’ve heard of Dock Ellis and his infamous, LSD-induced No Hitter. But his story is way more than that. And this film proves that and gives a glimpse into the world of the man, the myth(s), and the legend of Dock Ellis. All of your (self-proclaimed) clever acid-related puns are irrelevant. Your resistance to give in to the counter culture’s influence is futile. The connection between professional sports (in this case Major League Baseball) and mainstream media may not be as important as what first meets the eye. The Simpsons episode where Burns calls in the ringers, you know the one, is my favorite episode probably ever, so it should come as no surprise that anything involving an intertwining story of baseball and recreational (but in Dock’s case also performance enhancing) drugs is going to require further research and involvement. Dock Ellis is one of the great personalities to ever put on a professional sports uniform, and in case you’ve never heard the story, he is the first and only pitcher in MLB history to throw a no hitter…under the influence of LSD. We talked a bit with Director Jeffrey Radice, who made his directorial debut with No No: A Dockumentary, which will be screening at SXSW all week. With many fans and seekers of truth to Dock’s no-hitter hitting roadblocks when searching for footage of the game, how did you guys decide you were going to make this film and share the story? Footage of the June 12, 1970 no-hitter is orthogonal to the film that I imagined. The story is about Dock’s life and it can be boiled down to a hero’s journey or redemption story. The game is a convenient hook with which we thought an audience may be brought into theaters, but the plan all along was to flip the script and paint a portrait of Dock and have the film be more about him and less about the LSD. Have you seen/signed the online petition for footage of the game to be released? There is no conspiracy on the part of Major League Baseball to withhold footage of the game from the public. The online petition is interesting from the standpoint of public interest in the no-hitter and Dock, but it is a fool’s errand. You need to understand that MLB did not televise every game in 1970. The televised one game a week, and the first game of a mid-week double-header in San Diego was not televised. End of story. There is some 16mm film that was shot of that game, which we include in No No. I strongly doubt there is any footage in some MLB vault being stifled by the powers that be. What do you want viewers to learn from the Dockumentary? Beyond the fabled No No, why is Dock Ellis’ story important? My target audience for the film is between the ages of about 16 and 30. I want them to understand that drugs and alcohol bear significant risks and use Dock Ellis as a cautionary tale about some of the dark sides of abuse. Dock was amazingly honest about his afflictions and addictions and he had the charisma and inner strength to share his message with at-risk and incarcerated youth. 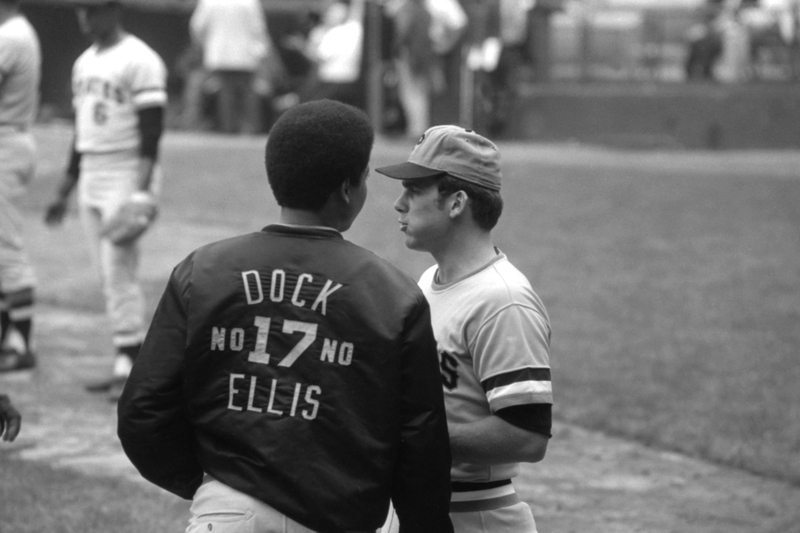 The story of Dock Ellis is important despite the fabled No No, not beyond it. That LSD no-hitter is a funny little accident, but the deliberate and meaningful things Dock did within his life for other people are a much greater legacy. The internet has given new life to Dock’s story and legend. Would your film be possible in an alternate universe where the net doesn’t exist? Donald Hall was able to write Dock’s biography prior to the public Internet. Dock’s story is independent of the Internet and largely pre-dates it. For the most part, much of the research was conducted outside of the Internet, by digging into libraries and archives and making telephone calls and such. We did develop a method of research, which we laughingly called eBay Filmmaking, but baseball memorabilia found markets prior to eBay. Now if you asked whether this film would have been possible without Adobe After Effects, certainly not in the form presented. (To clarify) Interest in Dock’s legacy has sort of skyrocketed in the internet universe. We will certainly take exposure to the story from any direction it comes. Not sure it’s a useful though exercise to consider whether interest in the story would be different in a different era. Donald Hall said that his book Dock Ellis in the Country of Baseball never did sell very well, so perhaps Dock’s legend has flourished in an Internet era? How has the film been received thus far? Theaters have been near-capacity, if not sold out. Reviews have been favorable. Audience reactions have been upbeat and positive. Dock’s family and close friends who have seen the film thus far have expressed very positive responses if they have not said outright that they loved the film. As documentarians, how did you distinguish reality from embellishment, truth from exaggeration, especially in researching this feat that stands as (as ESPN put it) “the counterculture answer to Babe Ruth’s called shot, the pinnacle of mastering one’s high.” Where, if at all, were those lines drawn? How does anyone, be it a juror or a newspaper reporter or a child hearing a family legend make similar judgments? We gathered all the evidence at our disposal, asked people who may have had first-hand and second-hand recollections of events, and presented all the evidence to the audience. We interviewed the friend who said he tripped with Dock before the game. Pirates’ photographer Les Banos told us that he called Dock and told him he was scheduled to pitch that night. Donald Hall, Dock’s biographer, included notes about the LSD in his early drafts of Dock Ellis in the Country of Baseball, from 1974 – 1975, and we offer evidence of the story being redacted then. Tom Reich, Dock’s agent explains why they needed to protect Dock who was still playing in 1976 when the book was published. I will allow audiences to form their own conclusions based on our research and its presentation. Dock’s character, personality,and stature put him in a league of his own in many ways. What can MLB players and professional athletes learn from Dock Ellis? Professional athletes and MLB players should start by learning who Dock Ellis was. They should also learn who Curt Flood was, and the personal sacrifices he made as a ballplayer that have a meaningful impact on their lives and personal wealth today. These men fought battles that were less dramatic and mythologized than the one that Jackie Robinson fought, but they were nearly as significant. Professional athletes should understand that fear, as Dock said fear of failure and fear of success, is common in their occupation and that drugs and booze are stopgap measures to confront their fears and a road fraught with danger. Dock wanted MLB to develop a comprehensive drug treatment program, and instead they continue to paper over the problem and engage in blame-shifting. What are a couple of things you’ve learned while creating No No, which by the way, is a brilliant play on words in creating the title? 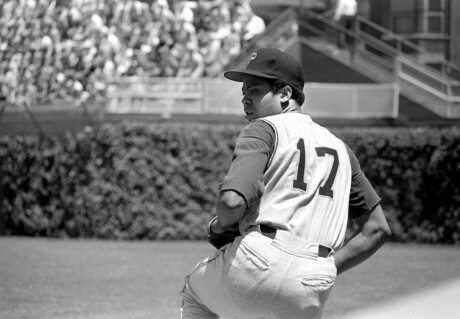 There is some suggestion that Dock Ellis and Dave Cash originated the term “no no” for a no-hitter with Dock’s LSD-induced performance. We were unable to corroborate that. In your opinion, why is MLB, and all professional sports leagues really, so against having outspoken athletes? Professional athletics are one of the most tumultuous battlegrounds for labor relations in the past half decade. The leagues and ownership would prefer to not have outspoken athletes speaking out about injustice, because it’s bad for business and it tilts public opinion in the dynamic between labor and management. Perhaps the greatest baseball owner ever, Bill Veeck, referred to his fellow owners in the 1950s as stuffed-shirts, and the pejorative seems to hold true to this day. With this being your directorial debut, did the final product scratch your directing itch, so to speak? I do hope to direct additional films, features and shorts, documentary and narrative. I do not wish to be pigeon-holed as a director of sports documentaries. My role model is Werner Herzog. I have learned what it takes to direct a feature film and it’s an enormous commitment, especially via independent financing. I have a few more films left in me, and I hope they’ll one day make it to the screen. Are you guys Pirates fans? If so, are they going to take a step toward championship territory this season? If not, who ya got? Who are your favorite players and teams currently and all-time? I grew up as a Yankees fan. My interest in baseball waned for many years from my teens until my early 30s. I am a Pirates fan after making this film, especially of those teams in the 1970s, the 1971 and 1979 championship teams and all the great characters who played on them. Love the Pirates of today and rooting for them to clinch another championship this year. Roberto Clemente is as close to a saint as baseball will ever have, and he has earned a place in all our hearts…what a great baseball player and human being and what a tragic ending to his life. What’s next for you, for the film, for baseball, for drug culture and activism in sports, for PED witch hunts, for steroid-era malarkey? Would love to script a television series around the MK-ULTRA project of the CIA in the 1950s, and developing a pilot script. The Dockumentary has a life all of its own. Professional baseball will very likely move onto its next drug problem and be defined by future drug-related eras, as it has been in the past by the so-called “Greenies Era” and “Steroids Era”. When are you scheduled to show at SXSW and how can our readers keep up with you and what you’ve got going on?